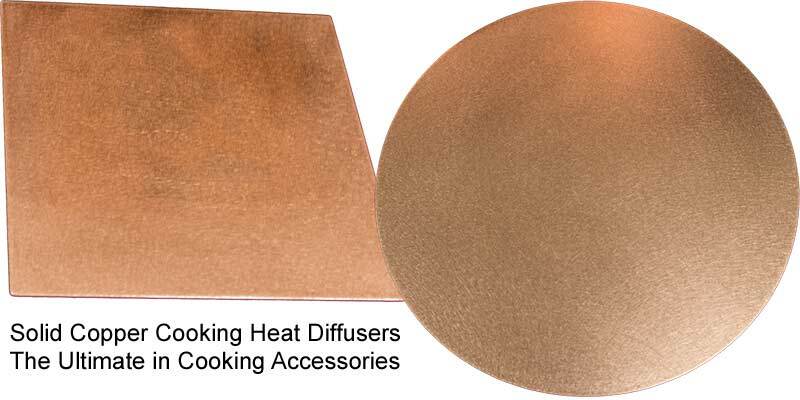 American Made Copper Cooking Diffuser Plates for the serious cook. ● Maintain even temperatures when cooking or baking. ● Large pan, small burner? Use a diffuser that is the size of the bottom of your pan for even temperatures! ● Great for simmering, making candy or making the perfect omelette, etc. ● Pies now can brown on the top and bottom more evenly. ● Make perfect risotto, fudge, candy or sauce without nearly as much stirring. ● Thaw frozen items quickly, as copper transfers heat faster than all other metals, (other than silver) including aluminum. ● Use as a cooling plate for hot items. ● A solid copper diffuser with heat up 5 times faster than iron or steel heat diffusers and will keep temperatures more even. ● Less burning, scorching and sticking while cooking. are resolved using our copper diffuser. Also notable; copper is over 20 times more efficient at transferring heat than stainless! ● Thick soups, pasta sauce, rice, beans are less likely to burn and stick with our copper diffuser. ● Works well with ceramic stove top cooking items. For me, the most important use is for making Ragu (Spaghetti Sauce). The sauce has to simmer for a very long time. I have a gas cook top and the burners are too hot, even at a simmer level. In the past, I have forgotten to check or stir the sauce and had a black layer of burnt sauce that completely altered the taste of the entire batch. What a waste! I prefer the control and flexibility of cooking on a gas cook top, over an electric. There is one disadvantage to gas cook tops, though — it can be difficult to get the heat low enough for projects like simmering a delicate sauce, making chocolate, or slow-cooking a braise. If you cook with Cast Iron, my diffuser is a must! Cast iron is a better conductor of heat than stainless, however it is nowhere near the conductivity of copper. A common complaint with cast iron cooking is that the middle area of the pan gets too hot, while the outer area is not hot enough. A copper diffuser solves that problem. Another common issue is cooking with larger cast iron (or any metal) pot or pan that is larger than the burner. Again, the outer area does not get warm enough and the middle has a tendency to scortch or burn. That problem is virtually eliminated with a copper diffuser. Another great use for the diffuser is oven baking. Place two, side by side, on the oven rack and place your pan on top for more constant temperatures without hot spots. Reports of cooking pizza and pies with unusually great results have come in. My diffuser plates are made of 14 gauge (1/16") pure domestic copper. In my home, we have large (restaurant ware) pots or pans that are much larger than the burner. Cooking that way is very uneven. Not any more! The Professional Size Rachiele Copper Diffuser will solve that problem. NEW! Dual burner diffuser for using with your griddle. Pancakes burn on the ends and are under cooked in the middle? The copper diffuser plate is to the rescue! Copper helps to even out temperatures throughout the entire griddle. Sunday mornings will never be the same! Wait... do you remember the television commercials about a magic metal plate that would defrost frozen food quickly? Well, it was simply a plate made of aluminum. Aluminum transfers heat quickly, defrosting safely and quickly. That being said, copper is about 50% better at thermal conductivity. So... our copper plates will defrost even faster! Nothing thaws meat faster! Please read our use and care before using. our customers do not bother to polish the diffusers. ● Be careful removing the plate from your cook top or oven. It may remain hot beyond what you might expect. burner and remove by lifting (after it has cooled) instead of sliding. ● Do not cook food directly on the copper. Use a pot or pan. I would like to give you comments from my mother, Rosalinda, who happens to be a gourmet cook. 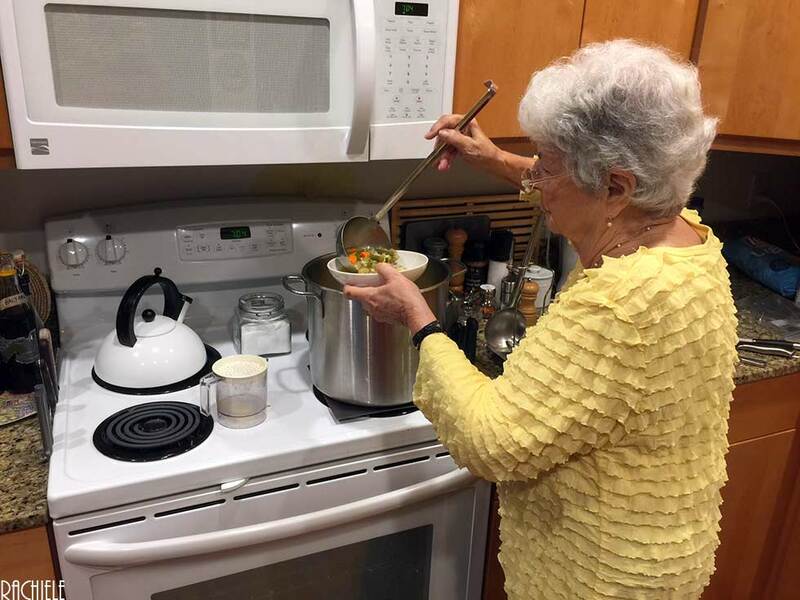 She makes a wonderful meat and vegetable soup that contains barley and split peas. She says it has to cook for 2 1/2 hours. During that entire time, she says she had to stir every 5 minutes. A comment from Joan Tucci, Author of best selling cookbook - Cucina & Familia: "Ciao, Water on large burner took 15 minutes to boil, my old diffuser took forever. Cooled off pretty quickly, forgot to time that." A comment from Linda Collier: Mine saved my sauce from burning and sticking so well that I am buying another as a gift for a friend. I would have never thought something so simple would be so valuable. It is now a necessary part of my cooking arsenal.